In Matthew 13:24-43, Jesus tells a parable in which the events surrounding the time of the end are symbolized as a wheat harvest. The fact that the end of the age is depicted as a wheat harvest is not surprising in light of the fact that the Jews revolted against Rome at the start of the wheat harvest in A.D. 66 marking the beginning of the end of the age and the most tragic war in Israel’s history. For a detailed interpretation of this parable in addition to its first century fulfillment during see the following Preterist commentary on Matthew 13:24-43. The fact that the end of the age is depicted as a wheat harvest in Matthew 13:30 is no coincidence since the events surrounding the end of the age began when the Jews revolted against Rome at the start of the wheat harvest. After Jesus finished His message, His disciples asked Him to explain the parable of the weeds. 37He answered, “The one who sowed the good seed is the Son of Man. 38The field is the world, and the good seed stands for the sons of the kingdom. The weeds are the sons of the evil one, 39and the enemy who sows them is the devil. The harvest is the end of the age, and the harvesters are angels. 40“As the weeds are pulled up and burned in the fire, so it will be at the end of the age. 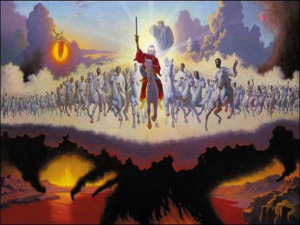 41The Son of Man will send out his angels, and they will weed out of his kingdom everything that causes sin and all who do evil. 42They will throw them into the fiery furnace, where there will be weeping and gnashing of teeth. 43Then the righteous will shine like the sun in the kingdom of their Father. He who has ears, let him hear. A Preterist Commentary on Matthew 13:39: In v. 39 Jesus says, “The [Wheat] Harvest is the End of the Age.” Not Surprisingly, the Jews Revolted against Rome around the Start of the Wheat Harvest. The angelic army in the sky of A.D. 66. 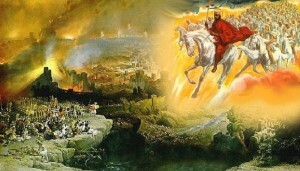 Notice the similarities between this event and the second coming as it is described in Revelation 19. 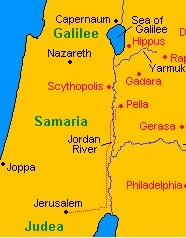 The wheat harvest occurs in the month of Sivan, the following month. Thus in fulfillment of this parable, the Jewish revolt against Rome and Jesus’ appearance in the sky with His army of angel harvesters at the end of the month of Iyyar portrayed in the image above both occurred right at the start of the wheat harvest. As stated above, this angelic army in the sky presumably lead by Christ appears to literally fulfill Revelation 19:11-14 and is the first miraculous appearance of Christ in the clouds during the second coming. The fact that this presage occurred at the start of the wheat harvest is a potent warning of the impending fulfillment of Matthew 13:39-43 in which the angels following Christ in the sky are soon to begin their duties as harvesters pulling up the weeds and burning them. These weeds are the wicked people of Israel. The fire engulfing these weeds represents both the otherworldly fires of hell and the earthly fires that were about to engulf Israel upon the arrival of Vespasian and his armies. For a detailed explanation of how the army in the sky in A.D. 66 literally fulfills Biblical prophecy concerning the “coming” aspect of the second coming see Jesus, the Son of Man, was Seen in the Clouds in A.D. 66. For an additional explanation of the other appearances of Christ during the Jewish War which seem to literally fulfill every detail of every prophecy concerning the parousia or second coming. 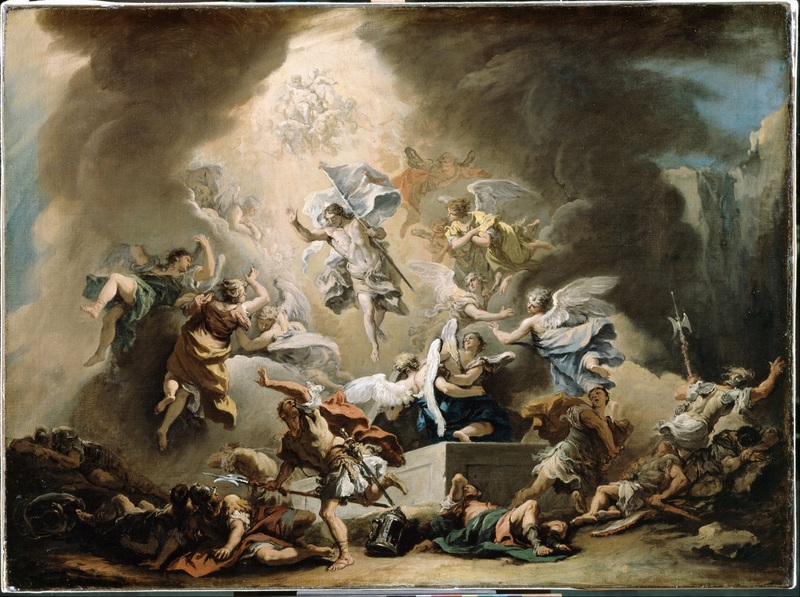 See Historical Evidence that Jesus, the Son of Man, was LITERALLY SEEN in the Clouds in the First Century. Each trumpet plague of Revelation signified important events in and around the Jewish War with Rome. Every plague was marked by an audible trumpet sound. A Preterist Commentary on Matthew 13:41-42: The Angels of the Harvest in vs. 41-42 are the Seven Angels of the Trumpets and Bowls of Revelation. The angels of the harvest in vs. 41-42 are led by the seven angels of the seven trumpets and bowls of Revelation. 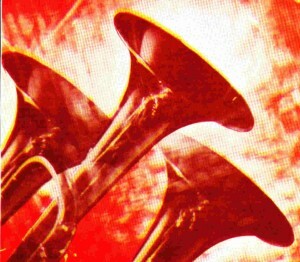 As is discussed in exhaustive detail in the commentary on the Book of Revelation, the seven trumpets and bowls are primarily fulfilled in several battles throughout the course of the Jewish War, each of which is literally signaled by the sound of a trumpet. 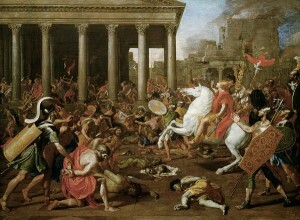 The burning of the Temple in A.D. 70. The burning of the weeds in Matthew 13:40 was fulfilled both in Rome’s scorched earth policy and the subsequent casting of the wicked to Gehenna. A Preterist Commentary on Matthew 13:40: The Burning of the Weeds in v. 40 is fulfilled in the Burning of Israel during the Jewish War and the Fires of Hell. The burning of the weeds represents the casting of the wicked into the fires of hell. This act of judgment is foreshadowed by Rome’s charred-earth policy. During the Jewish War, the Romans swept through Israel like a wildfire not only burning each city that rebelled against them but also igniting the surrounding countryside as well. 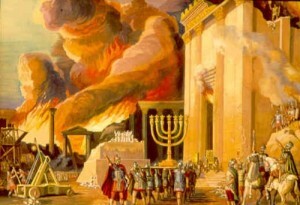 With Israel ablaze in unquenchable fire, the province became an earthly reflection of the fires of Gehenna.2 Therefore, the burning of the weeds represents both the destruction of Israel by fire and the casting of the wicked into hell. A Preterist Commentary on Matthew 13:30: The Gathering of the Wheat into the Barn represents both the Return of the Jewish Christians to Israel after the War and the Resurrection of the Dead. The resurrection was to occur at the seventh and last trumpet of Revelation which was blown at the start of the siege of Jerusalem in A.D. 70. 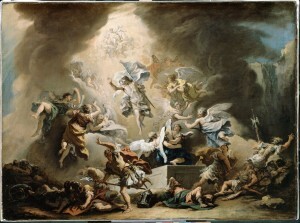 Jesus finishes His explanation with the words, “Then the righteous will shine like the sun in the kingdom of their Father (Matthew 13:43).” Here Jesus implies that the resurrected bodies of the saints are not unlike Christ’s own resurrection body after His ascension into heaven as it is pictured in Acts 9:3 and Revelation 1:13-15. In v. 43, Jesus describes the afterlife bodies of the saints in much the same way that they are pictured in many near-death experiences. 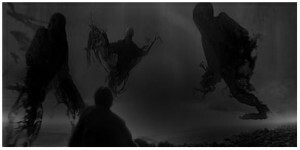 According to the testimony of many people who have survived clinical death, beings in hell look like dark shadows whereas beings in heaven are said to exude light. Here one can see the fulfillment of Matthew 13:43 in the resurrection to heaven: “Then the righteous will shine like the sun in the kingdom of their Father.” See How the Resurrection Bodies of the Saints Perfectly Mirror Jesus’ Resurrection Body after His Ascension Into Heaven Fulfilling Philippians 3:20-21 and ALL Other Bible Verses on the Resurrection!!!. According to the testimony of near-death experiences, spirits in hell (demons) are described as dark shadows as they appear in the movie Ghost. As stated in the above Preterist commentary on Matthew 13:24-43, the events surrounding the war with Rome at the end of the age are symbolically depicted as a wheat harvest. Unquenchable fire is literally fire that becomes so large and hot that it cannot be intentionally put out. See the commentaries on 1 Corinthians 15:50-54 and 1 Thessalonians 4:13-18: Preterism, the Rapture and the Resurrection, Revelation 11 and Revelation 12.